I took the boys shopping to Preston over the weekend to buy Tom's birthday presents. It's a lot easier now to buy him things than it was at Christmas. He's showing more interest in stuff now! 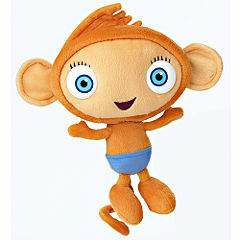 He loves Waybuloo, and Tinga Tinga Tales so that was easy, a Yojojo and a Monkey from those shows respectively. 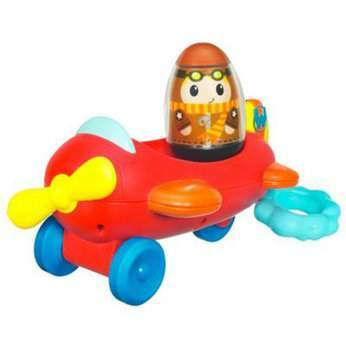 He is quite taken with the new Weebles toys too, so a Tree House (Tom haulled that off the shelf by himself, so I'm guessing he really liked it) and Plane found thier way into the trolly. 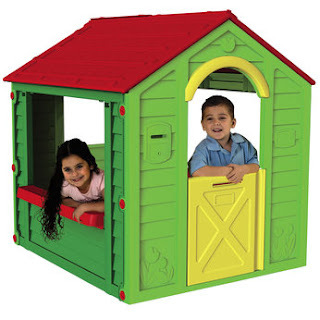 But the best on has to be.... the Play House! At a fab £50! Less than half what I thought I'd have to pay. And both boys like it too. There was one up for display in the store and Tom was bouncing around in the trolly making a grab for it, Jack was playing in side it, and at the price I couldn't walk past it. Getting it in the car to bring it home was interesting though! It had to be unpacked from it's box, Jack had to sit in the front seat (good job Daddy wasn't with us) and Tom had to be packed around very carefully. I drove home at 60mph on the M6, scared to death of having an accident with the heavily loaded car, stupid high winds, limited visability (no view out of back window at all) and unhappy about how the kids were sat - even though they were safe I was still worried. And now I have to store it for a month before Tom's birthday.... it's sat on the landing at the moment but it can't stay there. We can't close the bathroom door, and there is a good chance it could topple over ans squash one of us! It'll be worth it though. They both really enjoy playing in the garden (which reminds me, I need to call the Council to see about removing the old freezer which is sat - rusting - exactly where I want to build the play house) and it'll be good to have a big toy to play with.